Looking for a safe, durable, easy-to-ride, and reasonably priced scooter for your toddler or big kiddo? You've come to the right place! We reviewed over a dozen different two-wheel and three-wheel kick scooters, to find you the best options for the year. To learn more about how our hands-on reviews evaluated each scooter, scroll down to the bottom of this article. Otherwise, here are the top 5 kick scooters of the year, followed by our in-depth reviews. Scooters are a great way to get your kid outside exercising, training balance and coordination, and having fun. From about 3 years old upward, scooters are a super portable and versatile mode of transportation around the neighborhood. Here are the Best Kids Scooters of 2019! These are the best 3 wheel kids scooters to get your child, and they make an awesome first scooter. We really loved everything about them. The Maxi Micro is marketed for kids aged 5-12 with a weight limit of about 110 pounds. They are available in multiple fun colors, the boys who tested it liked the sleek silver Maxi version, and the girls tended to gravitate toward the purple Maxi. 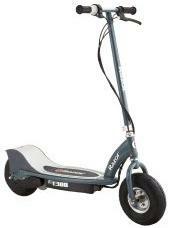 This is a safe, reliable, lightweight (about 5 pounds) scooter that is easy to learn, easy to maneuver, and tons of fun to ride! You might notice that there is a Mini and a Maxi version (the Mini is below at #2). The Mini is a bit more basic than the Maxi. The Maxi adds an adjustable handlebar height (from about 24" to about 28" height above deck), dual rear wheels, and higher weight capacity (112 pounds). It is recommended for kids 5-12 years old, though our 4 year old started with the Maxi kick scooter last year and it wasn't anywhere near too big. The front wheels are over 4.5" in diameter, with smaller rear wheels that are doubled up side-to-side for better braking, stability, and less chassis flexing around corners. The tires are rubberized and hard; not hard enough to promote sliding, and not soft enough to increase rolling resistance and reduce the life of the tire. The steering is easy to learn and control; to steer, kids lean right or left rather than turning the handlebars (like you would with a 2-wheeled scooter). As you lean, a unique lever mechanism in the front wheels makes them turn slightly in the direction you're leaning. The wheels are low resistance, bearings are smooth and quiet, the handles are soft and grippy, and the brake works well unless the rear wheels are wet (for that reason and others, we don't suggest riding in wet conditions with any kid's scooter). This Maxi Micro goes for about $130 online, and is sometimes less or more based on the colors or patterns selected. You can detach the handlebars for travel or storage, but for more convenience, there's a more expensive foldable version (but usually out of stock/hard to find). Interested? You can check out this Micro Maxi Scooter here. For something a bit less expensive but also less versatile, see our #2. This is the less expensive version of the Maxi Micro, intended for 3 to 5-year-olds up to 44 pounds. 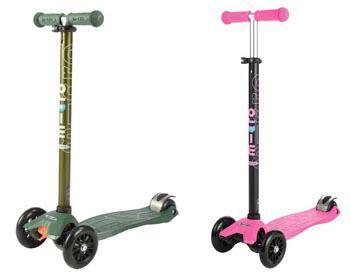 There are a few varieties of the Micro Mini Scooter. One is the Micro Mini Original, which is pictured to the right. Another is the Micro Mini Deluxe which adds an adjustable handlebar to make a bit more like the Micro Maxi but without the higher weight capacity, stronger deck, or dual rear wheels. And another is the Micro Mini 2-Go, which is for toddlers and has a little seat and storage cubby that can be removed when your kid is ready to try riding while standing. If you're ready to try a full riding scooter, we suggest either the Micro Mini or Micro Maxi (above) rather than paying the extra money for the Mini with an adjustable handle. In our opinion, buying the Micro Mini with the adjustable handle is a little silly since you will probably need a higher weight capacity than 44 pounds once your kid is tall enough to need the handlebars up higher. This review is primarily concerned with the Micro Mini Original, which does not have the adjustable handlebars. Another difference between the Mini and Maxi models is that the Mini has a single rear wheel which makes it a slower braker and the brake itself is a bit flimsier than it is on the Maxi. We also found that this version has a lot more flex in the scooter chassis overall, both in the sag of the platform when heavier kids stand on it, and also in the lateral flex of the entire scooter when turning/leaning. This reduces stability a bit but was only really an issue when the scooter was used by kids that were a bit heavier than the suggested weight limit of 44 pounds. But it also tends to be about $50 less expensive than the Maxi scooter, so there's some compromise if you're looking to save cash. The neighborhood kids who tested these scooters thought the Maxi was capable of going faster, turning harder, and was generally more stable than the Mini. In our opinion, we recommend skipping the Mini and going directly to the Maxi unless your child is particularly small (like under 35" tall) or you're on a very limited budget. With the Maxi handlebars all the way lowered it is small enough (24" high) for the typical 3 or 4-year-old, matching the Micro height, but having the ability to grow with your child. We did not find it more difficult to learn or manage than the Mini; in fact, we found the Maxi somewhat better since it showed less overall frame flexing during turns, giving kids a bit more stability and confidence. Overall, this is a very well built, safe, and reliable kids scooter that is really a lot of fun for smaller kids to ride. It is definitely one of the best 3 wheel scooters on the market. However, it won't last long in a house with a quickly growing child, so we suggest stepping up to the Maxi from the get-go. Interested? You can check out this Micro Mini Scooter here. 3. 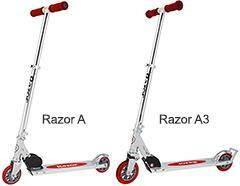 Razor A-Series Kick Scooters (A and A3). If you're looking for an excellent 3-wheel scooter, go with the Maxi Micro, but if you're looking for a little more challenge for a kid over 4-5 years old with great balance who wants to test his or her limits a bit, definitely go with the Razor A-series of scooters. The series is expansive, and it can be a bit daunting to figure out which one is perfect for your situation. We're going to help you out with that. The A-series scooters all have some great core features: adjustable handlebar height, durable and reliable rear brake, foldable to a portable size, lightweight aluminum frame, and a high weight capacity given their size and weight. They are all very well built, durable, high quality, and reliable. They have lower rolling resistance than the Micro series, due both to the fact that it only has 2 wheels and also harder tire rubber and good bearings. All things being equal (same kid, same surface, same exertion), that means the Razor will get moving a bit faster than the Micro. We liked the all-aluminum construction on the standing platform and handlebar, making it about the same weight as the Micro but more durable and with less overall chassis flex around turns. It also has a great and easy to use folding feature that makes transporting or storage very easy. The series begins at A, and then goes through A2, A3, A4, and A5. The A4 and A5 are really for bigger kids, aged about 7-8+ who have already been riding a scooter for a couple years. They are larger and more unwieldy for a younger first-time scooter rider (we review the A5 below, for bigger kids and adults). For a first-time scooter rider, we suggest starting with the A version, which we think is suitable for larger 4-year-olds and up. The A version is the smallest and lightest (and least expensive) in the series, coming in at only 5 pounds with a high 143-pound weight capacity. It has small, 98-mm diameter wheels, which we found to be high quality and low rolling resistance. The handlebars adjust down very low for the shorter kids, and up high enough to fit a 7-8-year-old. The kids over 7 years old who tested the A version thought it was a bit too small for them (handlebars too low, platform too short, wheels too small). The next size we suggest is the A3 version (we suggest skipping the A2), which is an excellent 2-wheeled scooter that supports up to 143 pounds but also has a higher handlebar height and longer platform. It also has a few little extras for fun riding - the front wheel has a bit of suspension to dampen rides over rougher surfaces, and it has a little wheelie bar on the back. See the little metal bar popping out behind the rear wheel? If your kid is looking to start doing tricks, they can lean way back without flipping backward, dragging along on the wheelie bar for fun. One of our older and more spirited test kids (8 years) was popping wheelies all the way down the road! The wheels are a wider diameter, at 125-mm, which helps them get over smaller bumps and pebbles without stopping in place. This is a bit advantage over the A model, which tends to have some sudden stops over little pavement cracks and pebbles. So, what are the downfalls of the A and A3 models? Well, they are 2-wheelers so it will take a bit longer for a first-time rider to get used to, and that might mean more falls in the interim. Also, the standing platform is very narrow, so while the pushing foot can rest temporarily on the Micro's platform, you'll be hard pressed to fit more than a couple toes onto these. Also, the small wheels on these scooters can cause them to get hung up on cracks and pebbles; the A3 is much better than the A, and the A5 is excellent but best for older kids and adults (see our review below). Note that the Razor, because it is a 2-wheeled scooter, uses the traditional steering system (not the leaning system). 4. Razor A5 Kick Scooter. Every once in a while, we test a kid product and the adults in the group end up being drawn to it and enjoying it just as much as the kids! That's exactly what happened when we tested out the Razor A5. It was too big for most of our little kid scooter testers, but the 10-year-old and parents all had a blast on it. Even the tallest guy in the group, at 6'-3" tall and about 200 pounds, thought it was a blast. And he commented that he was impressed that it fit a size 12 shoe with some space to spare. 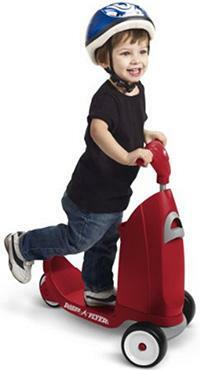 The handlebars adjust to reasonably accommodate kids from about 46" tall all the way up to adults. The weight capacity is 220 pounds, and the scooter is really fun and stable to ride. The wheels are the biggest in the group, supporting higher weights but also less likely to slow down or stop over pebbles or cracks in the sidewalk, and overall a smoother ride without as much vibration. The brake worked really well, though it was a bit noisy - making the sound you'd expect to hear from aluminum fender rubbing on a hard rubber tire; that's really the case with any of the big-kid and adult-sized scooters, so definitely not a deal-breaker. This is the biggest of all our best kids' scooters, supporting the largest height, age, and weight range. Even folded up (yes, it folds up easily!) it was rather big since it's about 3 feet long. Definitely small enough to throw in basically any trunk, or in the back of a Jeep Wrangler. This kids scooter is also relatively heavy, coming in around 9 pounds. We appreciated that this kids scooter has a very low standing height, so your inside leg (the non-pushing one) doesn't have to flex at the knee as much during pushing. It's very easy to fold open/closed, easy to adjust the handlebars (there is a little button on the side to put it back down after fully extending them), and feels very sturdy and well-constructed. We also really liked the built-in kick-stand, which didn't interfere with hard cornering and made life much easier when parking the scooter in the driveway, garage, or anywhere else. 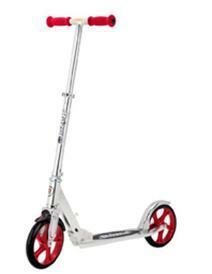 This is an awesome kid scooter that will really last you a lifetime. The adults in our group forgot how much fun scooters were, and several of them commented that a big-kid scooter that could also accommodate an adult is such an awesome concept. No more running alongside your kid, instead you can scoot right along with them for an awesome family activity. We found the Razor A5 for about $80-90, in a dark blue or red option. Finally, if you're a little worried about stability when learning to ride a scooter, you can get an awesome adult version of the Micro scooter (the three-wheeled ones) for adults up to 220 pounds! 5. Arcade Defender Stunt Scooter. 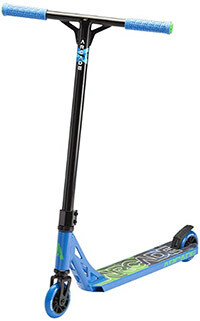 This is the best kids trick scooter on the market, offering superior quality components, excellent durability, and a nice smooth ride. This is the perfect stunt scooter for the child (usually over about 6-7 years old) who is a bit more of a thrill-seeker than others. 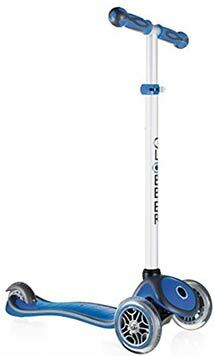 It's a great first scooter for kids interested in starting to try some tricks, like jumps, slides, and spins. Or, even if they're not ready for that yet, it gives them the opportunity to try things out when they're interested in exploring some more adventurous riding techniques. So what makes it a stunt scooter? A couple things. First, it has a very solid construction with sturdy 3D stamped neck (the part connecting the board to the headtube), 3D stamped steel fork (the part connecting the headset to the wheel), 3D stamped T-bar reinforcement, and the welding quality is quite good on all the components. Second, it has high quality and super smooth ABEC 7 bearings inside the 100mm wheels, which means that they are very low resistance, smooth, and didn't deteriorate in quality when we rode through some shallow puddles and dirt. Third, it's lightweight (just under 8 pounds) but strong enough to support riders up to 220 pounds and withstand impact during tricks. It also features a high quality sealed headset with IHC compression, a slightly concave deck (where you put your foot), and swappable wheels (up to 120mm, not included). Out of the box, it comes with 3 parts. One is the deck and wheels, one is the headtube and T-bar, and the other is the plastic floor stand (since there is no kick-stand). Assembly is pretty easy: you put the deck into the floor stand to hold it up, put the headtube onto the deck, and screw the two Allen bolts tight (Allen wrench included). The trick is to get the headtube and front wheel correctly aligned, by aligning the slots on each piece. On one of our test scooters (we had two), this alignment was simple and perfectly aligned, but on the other we aligned the slots but the wheel was crooked. So that involved some manual adjustment. Assembling the scooter took about 5 minutes, mostly because you need to remove all the packing wrap first. Once it's assembled, you're off to the races! Overall, we found the scooter to be well-built and comfortable to ride. The handlebar grips were good quality, and angle of the headtube was pretty good, and it felt very stable and well-constructed. My husband (about 195 pounds and 6' 3" tall) rode it for about 30 minutes and was impressed how good it felt under his weight. The brake worked really well, even when the wheels were a little wet. Steering had a tiny bit of resistance, which was nice rather than spinning around freely. The deck itself, at least the part where your foot can fit, is about 13" long and 4" wide. The height from the deck to the top of the T-bar is about 29.25" (the headtube is 22.5"), and the T-bar itself is about 18" wide. So what is this scooter missing? A few things: there is no folding headtube/handle-bars for storage and portability, no adjustable handle-bar height, and no kick-stand like some of the Razor options. But those aren't really features you find on a stunt scooter, they're features you find on a scooter designed for more recreational use, so they're excusable. Our 7 year old son loved the scooter, though he already looked a little tall for it (though he's pretty tall for his age, at 53" tall). We do understand that stunt scooters tend to have relatively low handlebar heights, and this scooter isn't really designed for comfort per se. So overall we have an awesome and super fun kids scooter here, but it's really designed for the kids who want to try their hand at tricks and stunts, rather than for the more recreational riders. If your kid is a thrill-seeker, this could be the perfect option for him or her! We will update with a longer-term impression in mid to late 2019. Interested? You can check out the Arcade Defender stunt scooters here. 6. Globber Primo 3-Wheel Adjustable Height Scooter. This is another great 3-wheeled kids scooter that is in direct competition with the Micro Maxi. It has several similar features: it is a 3-wheeled scooter, with two 4.5" wheels in the front, and one wheel in the back. It has a height-adjustable handlebar to accommodate different height kids, ranging between three height settings: about 26", 28.5", and 31" handlebar height above the deck (it locks into those three height settings). And its capacity for growing heights is matched by its weight capacity, all the way up to 110 pounds, the same as the Micro Maxi. It uses nice aluminum colored handlebar with rubber and plastic accents. It's a good-looking scooter, and we found that it was a blast to ride. Our test kids said that it was fast, easy to turn, and the deck felt lower to the ground than the Micro scooter series. There is a really cool feature to this scooter that the others didn't have: a front steering lock. The steering lock makes the scooter's steering non-functional, making it only track in a straight line. Now, this isn't great for an experienced scooter rider, but it's really fantastic for a new rider. After a day or two of riding without steering, learning to balance themselves on the scooter, most kids were ready to disable the steering lock and start using the lean-to-steer functionality. So, that's a nifty little feature that makes this scooter stand out in a growing crowd of kids scooter options. The rubber urethane front wheels and the bearings both had low rolling resistance and seemed to be smooth and high quality. The steering mechanism was just about as smooth as the Micro scooter series. With all these great features, why is it #5 on our list? Well, though this scooter tends to be substantially cheaper than the competition, and its features are quite good, we did find some drawbacks. First, we thought the build quality was a bit below the Micro scooters. There was a bit more flex in the deck as kids bounced and turned, and the braking system seemed pretty flimsy. Second, though the brakes did, in fact, make the rear wheel skid to a stop quite easily, the rear tire wore down from the friction really quickly. It wore down symmetrically from the braking, and asymmetrically from the skidding. After a few skidding stops (that our test kids seemed to love doing), the rear tire had bald spots that made for a choppy ride. This isn't helped by the fact that there is only one wheel that needs to take all abuse, in contrast to the Micro Maxi's 2 rear wheels. Finally, we thought there was more flex in the deck than the Maxi, such that heavier kids (>70 pounds) would make the deck sag down quite a bit, just to the point where it was nearly scraping the ground during riding. So it's hard to imagine that the weight capacity is truly 110 pounds: maybe it won't break the scooter, but it also won't make for very fun riding if the deck is scraping the road! So, overall a great and inexpensive contender to the Micro Maxi, with some definite drawbacks. But if you're looking to save some cash, this could be a great option! Here are some additional Best Scooter finds! Best Scooter for Toddlers (about 12 months to 2 years): Radio Flyer Ride to Glide Ride On Scooter. While the Micro and Razor series scooters are great for bigger kids, we also tested out scooters for the littlest kid in our group (he's 20 months). There aren't many options in this category, we only tested 2 (the other one we tested is also great, but harder to find), but we really liked the safety and features of the Radio Flyer Ride to Glide. The scooter is the most advanced option for this. Before you make it a standing scooter, you can use it as a super fun sit and ride toy. Since this article is about scooters we'll focus on that aspect, and if you want it without the side-down aspect, you can see the scooter-only option here. In our testing, we found this scooter to be sturdy and safe. It has 3 wheels with a very wide wheelbase on the front, so it was very hard to tip side-to-side. The steering is a simple point-and-go, and it doesn't have any extreme turning angles to keep things safe. It's very simple and the two little ones in our group figured out how to ride it pretty well after a couple tries. We think it's an awesome way to give kids exposure to the kick-scooter type of toy, and we think after a year or two using it they will hit the ground running with the Micro series. Cons? Well, for those looking for something that will provide a bit more of a scooter experience and less of a baby toy, hold off until about 2.5 years old and go with the Maxi Micro. Also, we think it's best suited for indoor play, or a very smooth asphalt driveway. In our opinion though, this is a great and relatively inexpensive way to get your baby scootering and having fun! Best Electric Scooter for Big Kids and Adults: Razor E300 Electric Scooter. For the kids who have it all, including good coordination and vigilance, this electric scooter is an awesome toy for kids. They'll be the envy of the neighborhood for sure. When we tested the E300, kids literally came out of their houses to see it and try it out. It doesn't go *too* fast, only about 15mph. That's certainly fast enough to get a kid in trouble, but not fast enough to make sure trouble is around every corner. In our tests, on flat suburban streets, we were able to squeeze about 45 minutes out of a single charge. Charging time is about 12 hours, so it's perfect to charge overnight. The throttle control is an intuitive twist, and it includes a hand brake for fast stopping power. The standing platform is quite large, big enough for even an adult with size 12 shoes to stand with their feet to the side. The steering is stable, the pneumatic tires are big and strong enough for most surfaces. We took it on a gravel path and it did quite well, maintaining a pretty smooth ride even over the bumps. This is a truly awesome and fun scooter. Make sure you get your kids a helmet and elbow/knee pads - a 15mph fall is nothing to scoff at! Cons? Well, the battery charge time is a bit long, and the instruction manual is very specific about the charging patterns you need to maintain. If you do not follow the charge/discharge instructions, the battery will definitely die within a couple years (and they're very expensive to replace!). Like a bike, all of the best kid scooters take a little bit of practice to get used to. If you start with a 3-wheeled kid scooter the practice time will be significantly cut down, your child will be less likely to fall and get road rash, and they'll be comfortable using it after the 2nd or 3rd try. For those reasons the 3-wheeled scooters are a great first option for kids; we got them for ours when they were 3, and they used them until they were about 6 and then switched to the 2-wheeled scooter. Note that the picture below shows our all-around best kids scooter, the Maxi Micro 3-wheeled scooter: notice how it has 3 wheels and the handlebars adjust for a wide range of ages and heights? Excellent form factor and versatility. We've gotten a lot of questions about cute and fun helmets; we suggest checking out Raskulls, which has a number of awesome options. In addition to whether they have 2 or 3 wheels, kids scooters vary in a few other important ways. 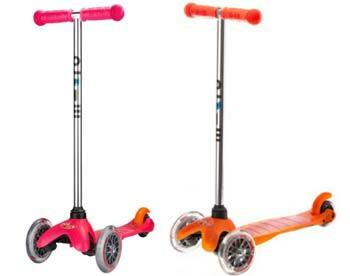 These include weight and height capacity, wheel size/diameter, stability, safety, braking capability, price, and fun. All of our top-rated scooters are excellent in all of these regards. We suggest starting with a 3-wheel kick scooter and then advancing to a 2-wheel kick scooter as they gain confidence, skills, and height. First, weight and height capacity are important, as many little kids scooters have rather low weight limits and handlebars that you will find a 4-5 year old growing out of quite quickly. Make sure you purchase a unit with a weight capacity at least 20 pounds heavier than your child, and height-adjustable handlebars. Second, wheel size (diameter) is important. The larger the wheels, especially the front wheels, the more versatile the scooter is across varied terrains (even little pebbles and cracks on the road). If you purchase one of the less expensive scooters with tiny diameter wheels, there will be situations when your child will bump up against a pebble or crack in the sidewalk and the scooter will suddenly stop (possibly sending your child flying forward). This is the same thing that can happen with a skateboard. The best kids scooters should not only be fun, they need to be safe, and the larger the wheel diameter, the safer the ride. Third, stability is impacted by several factors, but we've found that the width between the two front wheels (on 3-wheel kids scooters) is important, as is the standing platform width. In general, the wider the gap between the two front wheels, and the wider the standing platform, the better the stability. This will make the scooter easier to learn, and a more stable experience around the turns. Fourth, a braking system is great to have and most are quite easy to use. Though most kids' scooters are equipped with the push-down rear wheel fender brake, some do not include a brake at all. The best kid scooters will always have a rear brake, which is especially helpful for those downhill rides when you simply need to slow down a bit while cruising. In our tests, we've found that the wider and sturdier the rear step-brake, the better it works. The thin aluminum ones don't work very well especially when the wheel gets a bit wet and reduces friction. As always, kids should use caution riding scooters, as the brakes are never super effective for stopping quickly. With these factors in mind, we pulled together over a dozen of the most popular kids scooters on the market today, nearly half of which were 3-wheeled and the rest 2-wheeled (and one was electric!). They varied in weight capacity from 35 to 200 pounds, some had adjustable handlebars and some didn't, and some showed some build quality issues that emerged after only a few weeks of use. We strongly recommend 4 of the kids scooters we tested: The Mini Micro, Maxi Micro, and the Razor A3 and Razor A5. We review each of these best scooters above, along with a few additional recommendations. Be sure to also check out our reviews of the best kids bicycles of the year.